NOTE: Rhubard leaves are toxic and should be avoided. However they can be used to make an organic pesticide. Trim the ends of the rhubarb and cut into 3cm chunks. Place in a saucepan with the orange juice and caster sugar. Heat gently, stirring until the sugar has dissolved. Continue to cook at a gentle simmer until the rhubarb is cooked, which will be approximately 5 minutes. Put a single layer of the cooked rhubarb into the bases of six lightly greased ramekin dishes, reserving the juices. Taste the rhubarb. If it is too tart, dissolve a little more sugar in the juices of the fruit, then spoon a dessert-spoonful of juices into each ramekin. Place in a roasting tin and set aside. Oven on to 140OC/gas 1. Put the cream into a saucepan and heat gently to scalding point. Whilst you are waiting, beat the egg yolks and caster sugar with an electric whisk, until thick and foamy. As the cream comes to scalding point, slowly pour the hot liquid onto the eggs and sugar, stirring all the time. Strain the custard through a fine sieve, then carefully pour into the ramekins. Place the roasting tin into the oven, adding hot water to the tin to come half-way up the sides of the ramekins. Bake for about 40 minutes. Is it done? – gently slant a ramekin to one side. The custard should come away from the edge of the dish with the centre remaining a little wobbly. Remove from the oven and allow to cool. Cover and refrigerate overnight. 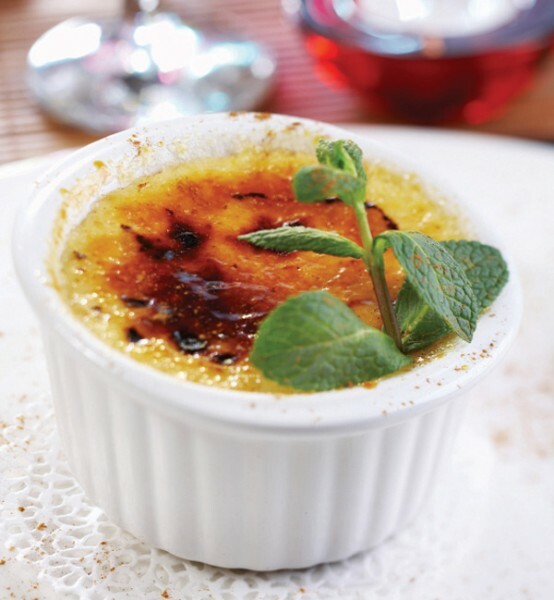 To serve sprinkle a teaspoon of caster sugar evenly over the surface of the custard and caramelize with a blow-torch. Serve immediately.